Welcome to our guest blogger, John Collins. John is a National Religion Consultant for Sadlier and a popular speaker at conferences and workshops around the country. He and I will be presenting together at the annual “Catechist Night Out” in the Diocese of Rockville Center on April 15th. When we registered our daughter to begin her first grade religious education program, I volunteered to teach when the call for catechists went out. I had been involved in faith formation before…as a catechist, a parish director and consultant. Now it was my turn to be in the classroom again. I heard, “Sorry, we have all the first grade teachers we need, but we still need teachers in grade 2.” So I offered to take second grade that year, and continued as a catechist in second grade for 10 years as my daughter moved through the grades in our parish program. I was always amused by this response and wondered why they hadn’t seen an image of the Last Supper in their own house. Thank God for grandmas, and grandpas. They always seem to have evidence of Catholic Identity in their house and children see, and probably ask questions about, the pictures, images, and religious articles. But why can’t children have evidence of their Catholic faith in their own homes? … a crucifix, picture Bible, statue, Rosary, Advent wreath, Nativity set at Christmas, the list of possibilities could go on. We certainly have lots of secular symbols and images at Christmas, and as I write this article I can picture all the Easter bunnies and decorations in the stores I’ve been in recently. At both of these seasons, the real significance gets overshadowed by the commercialism that doesn’t always speak of the true meaning. Perhaps having Catholic signs and symbols and other evidence of “being Catholic” in the home isn’t something that comes to mind to parents. Maybe they think that all they need to do is send their children to faith formation classes and everything happens there. Catholic identity is important…at Grandma’s house. I remember speaking at a day for catechists for the Diocese of Portland, Maine, some years ago. The bishop at the time, Bishop Malone, gave the keynote address. One of his comments still sticks with me to this day: Parents are not “marinating their children in their faith” as they are growing up. He recalled traditions from his childhood and the religious images and items that would be in Catholic homes. He talked about the challenges catechists have today because children come to us with varied experiences and backgrounds in their Catholic faith and traditions. Children are not being “marinated in the Catholic faith”… exposed to Catholic signs and symbols, practices, traditions …in their own house. They are not seeing evidence or hearing models of what it means to be Catholic and what we do as a Catholic parish family. Grandparents play a key part in passing along the faith to children. 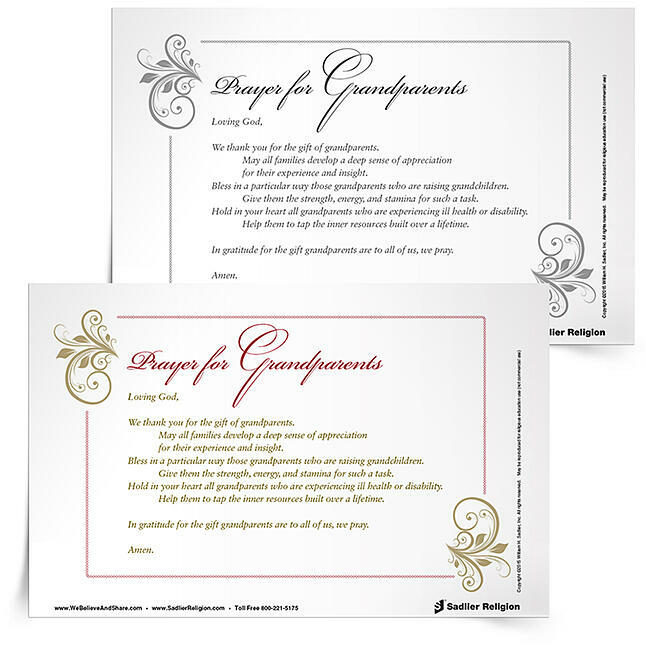 Download a “Prayer for Grandparents” and share it in your home or parish.